Poverty, unemployment, poor service delivery, lack of economic growth. There are a lot to be done before we will see the African continent truly thriving. The need for interdisciplinary research has never been greater. 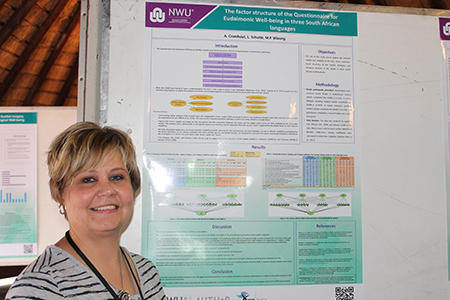 The Optentia research focus area on the North-West University’s (NWU’s) campus in Vanderbijlpark recently hosted a day dedicated to such research. - To cultivate the ability to imagine yourself in the shoes of someone who may be different from your and be an intelligent reader of that person’s story. During her official opening of the event, Prof Linda du Plessis, deputy vice-chancellor responsible for planning and campus operations in Vanderbijlpark, said that research cannot be conducted in isolation. She argued that a multidisciplinary approach to solving society’s research problems have become essential. Prof Du Plessis described Optentia as a research flagship of the NWU. She praised the focus area for their contributions. They do not only focus on optimising individual and organisational potential. They also create an environment where staff and students can flourish and subsequently contribute to society in a meaningful way. Ms Amanda Cromhout with a poster detailing a research project that she has been working on with co-researchers L Schutte and MP Wissing. The day boasted a jam-packed programme during which experts from all over the world joined the conversation by participating in two different webinars. The Yabelana Community Information project for older persons was also launched on the day. An exhibition of posters detailing research projects from a variety of disciplines wrapped up the proceedings and offered delegates the opportunity to network. Indeed it may be said that Africa has her fair share of challenges, but she was also richly endowed with children who love her very heartbeat. Children who, by working together for the greater good, will help each other build a better tomorrow for all.